Is Enid Blyton Too Old-Fashioned to Be Relevant? 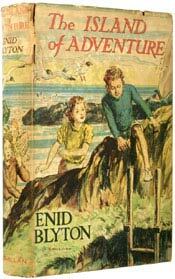 Is Enid Blyton simply an anachronism? Does the fact that she has sold hundreds of millions of books count for anything when critics say her adventure stories are old-fashioned and no longer relevant to today’s young readers? My colleague Richard says yes, and I agree. I grew up with her books, in Canada, in the 1980s (and some 90s), and absolutely loved them. If the notion of boarding schools was foreign to me, if I didn’t know what a kipper was, it just made the books all the more exicting, exotic and adventurous to me. I refuse to believe for a moment that today’s children are unwilling or unable to explore and enjoy worlds outside their own through books. Isn’t that one of the chief joys reading? And while I understand that Blyton wrote during a different era, and some of her choices of inclusions – depictions of golliwogs, for instance – may ring sour today, I also think children are brilliant creatures capable of understanding context and historical differences, if we take the time to explain it to them. In my opinion, those detractors who are decrying Enid Blyton’s books as no longer relevant are all the voices of adults, not kids. Relive the glory days of Enid Blyton’s Famous Five and Secret Seven, and decide for yourself.